For a while I tried to drink enough green tea to get the reported health benefits (stuff like improved focus, a reduced risk of cancer, a speedier metabolism, increased longevity). It's no mean feat! To actually reap the health benefits of green tea you need to drink 3-5 cups per day. That's a lot of kettle boiling, a lot of brewing and a lot of trips to the loo! Which is why it makes total sense that people are going crazy about matcha tea these days. Did you know in terms of the antioxidants they offer, one cup of matcha equals 10 cups of green tea!? Now that's bang for your buck! 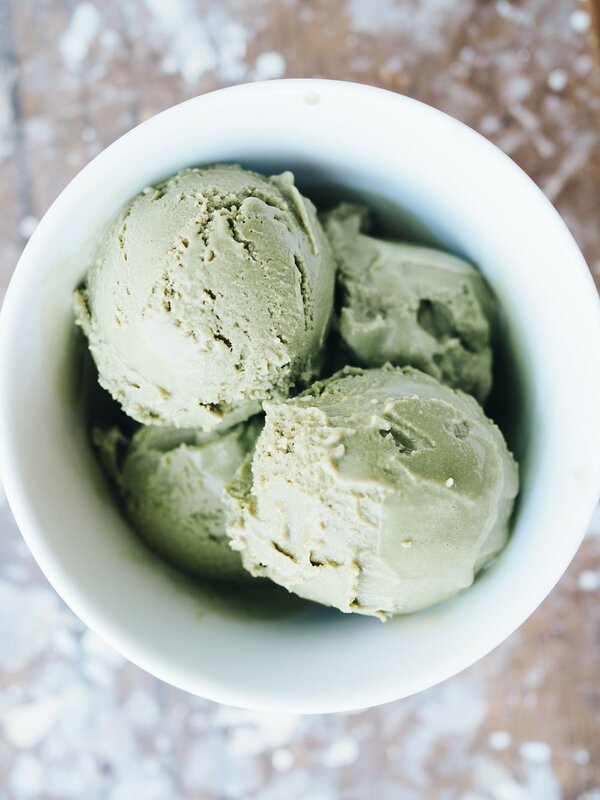 Apparently green tea ice-cream dates as far back as the 1870s, when it used to be served in Japan at royal dinner parties, in the shape of the Mount Fuji volcano! It may have been around long before then, but its true origin remains unknown. Probably some ingenious old grandma discovered it one afternoon hundreds of years ago while tinkering in her kitchen! Anyway, it's only since around the 1990s that it has started to spread around the world, and I'm very glad it has! 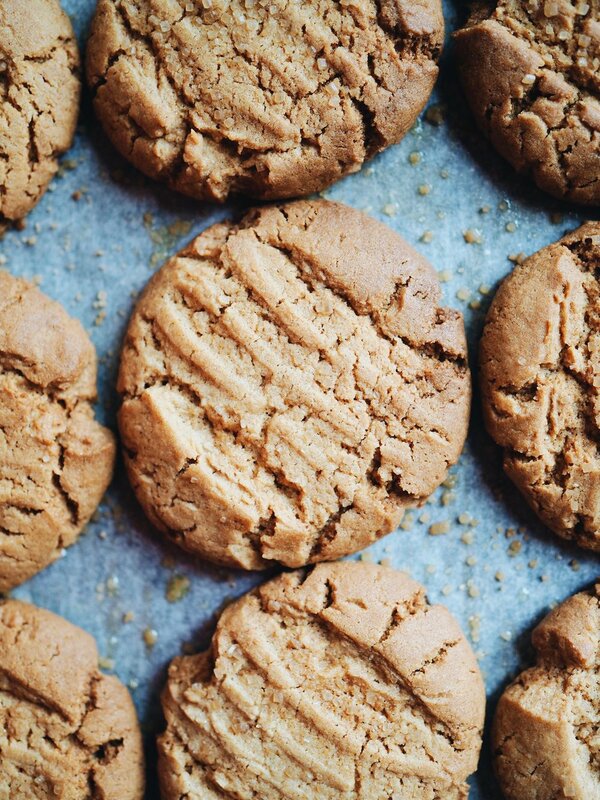 I decided to make a batch of ginger nut biscuits and voila! 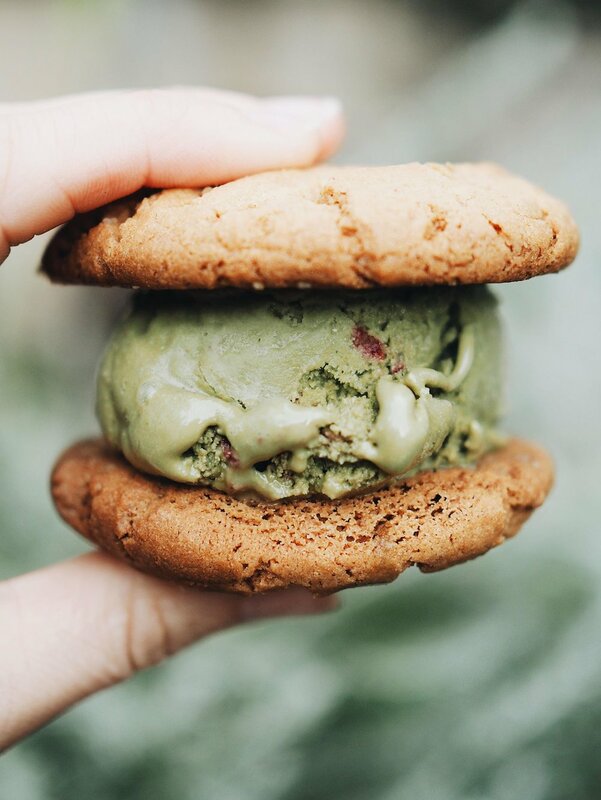 Matcha Ice-cream Sandwiches! If you'd like to make ice-cream sandwiches for yourself too, I've got a recipe for vegan Anzacs that'll do just the trick, you can find it here. Pour your mixture from the saucepan into the ice bath, then add the coconut cream and a pinch of salt and whisk to combine. Now pour everything into your ice-cream maker and set it to churn for 30-60 minutes. You'll know the ice-cream is ready when it's gone all cold and solidified. If you're not eating it straight away, stick the ice-cream in a Tupperware container in the freezer. Serve topped with crushed nuts, fruit or a little dark chocolate.